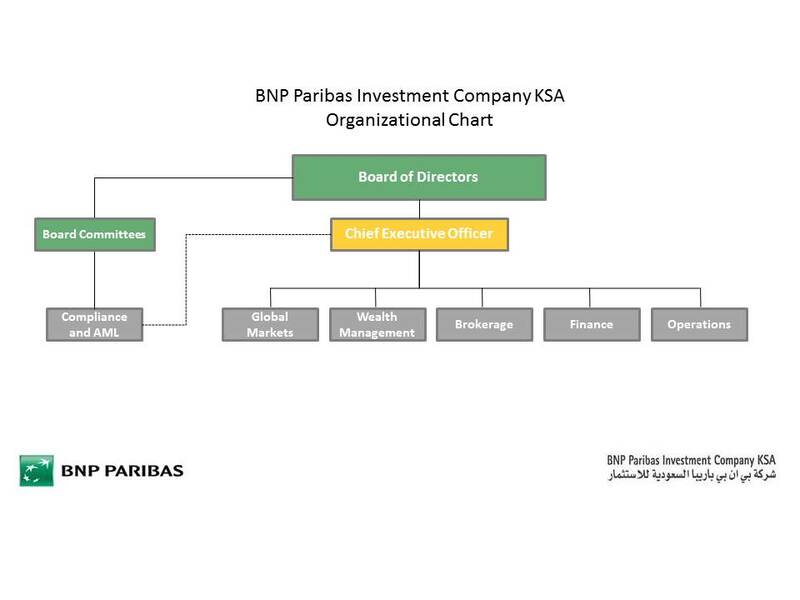 BNP Paribas Investment Company KSA is a Closed Joint Stock Company (“BIC” or the “Company”) was established as a limited liability company on [25th August 2008] and licensed by the Capital Markets Authority (“CMA”) with effect from 28th August 2010. The Company is licensed to conduct securities business in dealing as principal and agent, managing mutual funds, underwriting, advising, arranging and custody I securities. BIC converted from a Limited Liability Company to a Closed Joint Stock Company in November 2017 and currently has a paid up share capital of SAR 87,500,000 which was approved as a capital increase by the CMA on 23rd December 2014. The Company is a subsidiary of BNP Paribas S.A. and operates in Saudi Arabia under Commercial Registration Number 1010270533, Capital Markets Authority License Number 13173-37. BIC’s investment banking team, in conjunction with the relevant specialist teams in BNP Paribas based outside of Saudi Arabia, participate in originating and arranging transactions on debt, equity and hybrid capital markets. BIC provides custody services to its clients using BNP Paribas’s Global Custody platform supported by its network of affiliates and sub custodians to provide local capabilities in Saudi Arabia. BIC provides brokerage services on local exchanges in Saudi Arabia as well as marketing financial instruments and securities on behalf of other BNP Paribas entities including fixed income instruments, foreign exchange, rates and OTC derivative transactions. BIC provides wealth management services to its onshore private client segment. To view this page in Arabic please click here. If you have a complaint on any of our services or have any suggestions, you can contact us on 00966 11 273 9134 or visit your nearest investment centre.